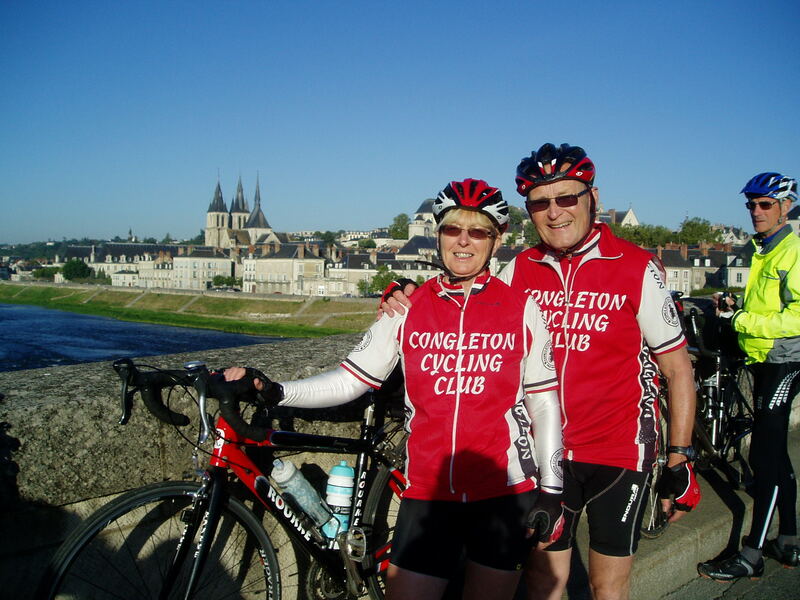 “Bob was organiser and leader of the CTC Holidays and Tours Caen to Cannes cycle tour, covering around 1400 kms in sixteen days. This is a classic ride, from the Channel to the Med. Riding mainly on minor rural roads. We passed through the rolling green countryside of Normandy to cross the Loire at Blois with its chateau and then headed through the forested central region into hillier terrain, to pass through the Parc Regionale de Volcans in the Massif Central and on through remote areas of the Auvergne. We rode through the Ardeche Gorge, to cross Provence into the Luberon. We reached the Cote d’Azure at Cannes after passing through the spectacular Verdon Gorge. The tour group of fifteen moved on each day, between 50 and 110 kms, sightseeing from the saddle, with some shorter days, which gave opportunities to explore. There was a lot of climbing along the way, with the altimeter accumulating over 15000 meters of ascent. The Mont Ventoux, legendary in the annals of the Tour de France was also on the itinerary. This was a particularly challenging ride, because six weeks earlier Bob broke his collar bone and fractured two vertebra in his neck in a freak accident in which a piece of road debris jammed in his front wheel. It was not until the day before the tour started, that he was given the medical OK to take his bike. It was with the advice “As long as you take it easy”. The advice was heeded, but Bob still rode at least three quarters of the distance, with just the odd ride in the support vehicle. Georgina had no such option, and rode it all before finally returning from Nice by air, whilst Bob helped drive the hire van back to Caen. Bob Banner organised this ride, in surprisingly warm, calm and bright conditions, leading Bev Hambleton, Mark Allen, David Grocott, Peter Hayhurst and David McVitie via Brereton Country Park, Davenport / Dane Valley, Swettenham, Newsbank, Marton, Gawsworth, through and around Sutton village, to Fairways Garden Centre where they enjoyed a late breakfast / early lunch and a rest / chat before returning on the same main route – but this time, mostly downhill – until they were faced with Radnor Bank and then went their separate ways. The riders thanked Bob and wished him “All The Best” for his forthcoming heart surgery. Our two representatives recorded their best rides of the year: Kelvin Milward – 56:45 and Pete Smith – 57:08. The winner was (as usual) Simon Bridge (Manchester Wheelers) with 49:00. Jim Cook, who led this ride, was concerned about the forecasted gales and rain but he and the six companions had suitable wet-weather clothing and everyone was happy with the dry but windy conditions. Denise Hurst, Charli Alston, Mike Line, Marcus Rohrmann and Jamie Gibbons (Guest), plus Peter Hayhurst (who turned for home near Nantwich), rode at chatting speed, via Hassall Green, Haslington, Weston, Wybunbury and Peckforton, to old Ma’s Café at Gatesheath. They had a lucky escape when a large oak tree crashed into the road only 30 yards ahead – but they managed to stop, just in time, and then formed a chain to hand their bikes over the tree. The return route, mainly wind-assisted, was via Huxley, Bunbury, Calverley, Church Minshull, Warmingham, Smallwood and Astbury where the heavy rain commenced, so they were soaking in no time – but pleased that it had been a dry ride until then. Karen Line (Mikes mum), Bob Banner, Dave Grocott, Paul and Alistair Kennington. Mike has been taking his mum out training. It turns out that she is from a cycling family and used to be a member of Hainault R.C. where in her younger days she was club junior BAR and did 24 min 10′s and a 1:0 25! They we lucky with the weather, as it had turned out dry and relatively warm for the time of year, always a bonus for cyclists. The ride out went out through the country lanes to Middlewich before turning to Goostrey and a coffee break at the Pavilion Cafe at Jodrell Bank, a distance of some 20 miles. Bacon sandwiches were the order of the day on our table. The ride back into Congleton was taken at an easy pace and completed a very pleasant 30 mile Saturday morning cycle. Two Members competed in this final flat Time Trial of the season. Pete Smith recorded 1:00:27 and Nick Decker posted 1:04:14. The winner was, as usual, Simon Bridge (Manchester Wheelers) with 52:43. 9 members of the club, namely Bill Boynton, John Broadbent, Jim Cook, Sam French, Stephen Kane, Paul Kennington, Joe Langford, Mike Line and Marcus Rohrmann set off, on a beautiful Autumnal morning, for New Mills in the High Peaks. The ride took in the Cheshire Cycleway to Henbury and then on to Adlington, where they joined the cycle pathway to Marple. Once they left the old railway line, they started to hit the hills in earnest with a very steep climb out of Marple Bridge to the ridge behind New Mills. After refreshments in Llamedos Coffee Shop, the hills continued unabated, with further 10%+ climbs out of Disley and on to the rode to Rainow. The group split on the Rainow / Macclesfield road to allow the younger, more enthusiastic members (and Bill) to carry on the original publicised route and to slay further vertiginous ascents. The group that followed the original devised route route climbed over 4600ft whilst the older and perhaps wiser group climbed a mere 3400 ft. Bar the mud on the route to Marple, the route was enjoyed by one and all and should be considered for the Club Run List of regular routes. Organiser Derek Heine, reports: “It did look like a fast day from the start, and the first few recorded times of the day had already set the bar very high indeed. By rider number 8, Stewart Gregory, coming in with 21:07, I think we all expected some good times. I don’t think anyone could have expected to have seen 4 event records being smashed today, with a very impressive win from Tejvan Pettinger knocking 14 seconds off the previous record, the team total time going under the hour by the combined excellent times from the top 3 from Buxton CC, and not one, but four ladies going under the previous record, which had stood since 2008! Peter Greenwood cannot go without a mention, by beating his last year’s record as an over 60’s Vet (by 3 minutes!! ), and setting the bar very high for future years.” CCC Members Nick Decker and Ben Norbury were within 1 sec at 22:58, Mike Jones recorded 23:18 and Kelvin Milward, a very impressive 24:58.